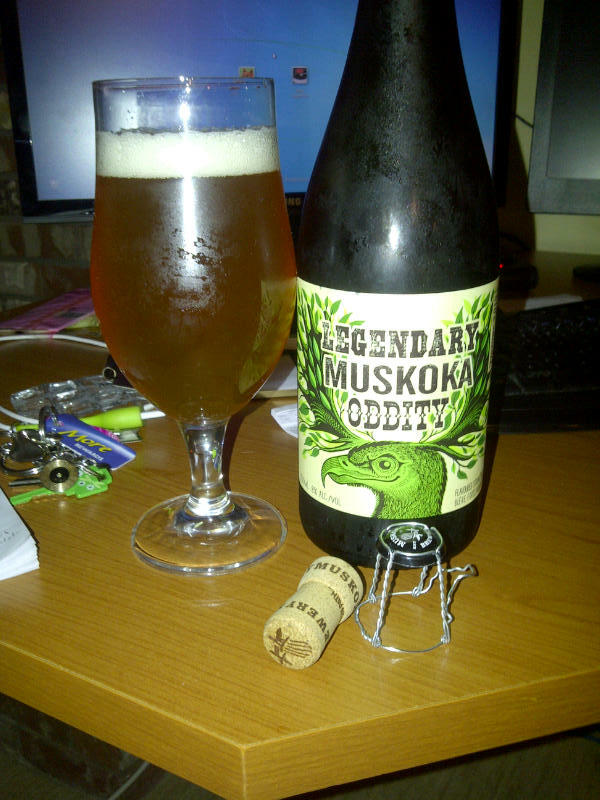 From Bracebridge, Ontario’s Muskoka Brewery comes their “the Legendary Muskoka Oddity (Vintage 2013)” considered a Belgian Strong Ale but tasting more like a Saison. This interesting beer pours a cloudy straw yellow colour with a creamy off white head. The aroma consists of Belgian yeast, fruity, citrus, orange, spices. The flavour consists of yeast, huge pepper, orange peel, juniper berries, citrus and some spices. The alcohol content of this beer is 8% but you will not taste it one bit. This is a beer you should pick up if you are able to find it in store. If not, do what I did and hunt high and low and then when you cant find it have it brought into British Columbia other ways. Commercial Description: Each year the tempered thaw of Muskoka winter gives rise to new and strange creations. Legends date back to the 1800’s when lumberjacks and fur traders took to the woods and ecnountered the mysterious culture and wildlife in the unknown Northern region. Today, we echo our ancestors’ quest and have unearthed this season’s most distinct offerings. The culmination of these ingredients rests in the LEGENDARY MUSKOKA ODDITY brew. We invite you to Release The Legend. Ingredients: Pure Muskoka Water, Heather Tips, Juniper Berries, Sweet Orange Peel Shavings, North American Malts, Noble Hops, Belgian Yeast and Belgian Candi Sugar. This entry was posted in Belgian Strong Ale, Imperial and tagged belgian strong ale, belgian yeast, Bracebridge, citrus, heather tips, juniper berries, muskoka brewery, ontario, orange, orange peel, pepper, peppery, spices, trappist yeast, yeast, yeasty.